I have a Feature installed using an Installation Profile. But I always have to go and Revert a particular Component so that it's no longer Overridden (so that, for example, the Feature's Blocks appear). I just wanted to know if I can take this step programmatically using code itself in the Installation Profile. In the screenshot below, I've shown the component that has to be reverted programmatically (in the screenshot, it's already reverted back so check box is not available). Here are a few thoughts though on resetting your features programmatically or as add-on install scripts. The Strongarm module could be useful as well to force your Feature to retain its default state I think. I have to agree with @Letharion in his comment on your OP. I would want to know that other important things aren't being mistakenly modified during the install process. You can revert a single features module with features_revert_module(). Where 'module' is the name of the specific features module (i.e. the the module generated when you download the feature) and 'component' are the components of those features. So if you just want to revert the fields defined in the feature you can use 'field' for component. 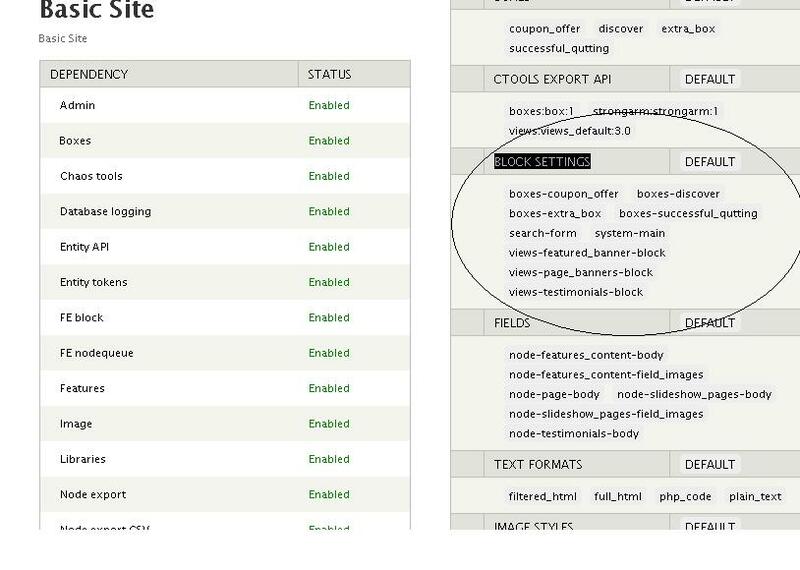 I could solve the issue by using the hook function fe_block_settings_features_revert('basic_site') where fe_block_settings is the hook i.e. the component here and basic_site is the feature/module name. * Rebuild & Revert all enabled features. * Reverts all components of a feature. // Use the $component argument of this function. Not the answer you're looking for? Browse other questions tagged 7 features or ask your own question. How to revert a feature in hook_update programatically? How to always run hook_update_N automatically, regardless of the 'N' value? Why isn't my feature overridden after I change a rule in it? Why does my 'UUID, Webform, Node' Feature remain overridden? Am I missing a step with using Features?